Ground outsole and eye-catching good looks. 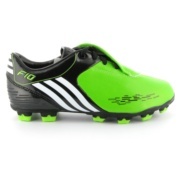 Stand out in the game with the Macaw Green adidas F10 i TRX FG football boots and exhibit perfect control over the ball. Modelled on the F50 i TUNiT boots, as worn by Barcelona superstar Lionel Messi, the adidas F10 i TRX FG is designed for quick, skilful players who need a light boot and sleek fit.